Tim Elliott from Winecast is the host for the 30th edition of the monthly wine-blogging event Wine Blogging Wednesday, started by new dad Lenn Thompson from Lenndevours. This month Tim's brief was to find a new world Syrah/Shiraz, or a blend that contained at least 51% of its juice from that varietal. I decided to try a new wine this month, and was pleased to find a wine from a pair of new winemakers in the Santa Ynez AVA: Black Sheep Finds. The 2005 Hocus Pocus Syrah is their very first wine. 600 cases were made, and it is available through many LA area retailers. Who are these Black Sheep? They are the duo of Peter Hunken (of Stolpman Vineyards, Piedrasassi and Holus Bolus) and Amy Christine (Sommelier of AOC restaurant and rep for Veritas Imports in Los Angeles), and their intention from the start was to make a wine that their friends would find delicious and affordable. The 2005 Hocus Pocus Syrah ($17.99, Mission Wines) is a supple, almost silky syrah with very good QPR that will appeal to pinot noir lovers. It is dark, dark violet in color and has abundant herbal aromas: thyme, anise, lavender. When you drink this smooth wine, you get loads of blueberry and blackberry fruit touched with a little bit of sweet wood and some mineral and herbal notes. Not as peppery or as dusty as many syrahs, it is also not overly oaky since it spends only 10 months in the barrel--20% in new oak, 80% in used oak. The resulting wine is not small, at 14.9% alc/vol but it is nicely in balance and easy to drink. Grapes for this syrah were sourced from the Santa Rita Hills and Santa Ynez AVAs, so it is a Santa Barbara County wine all the way. We had the syrah with a Moroccan Lamb Tagine that combined aromatic spices with tomato and lamb cubes. After the lamb went through an interesting braising and browning method, it was cooked for an hour in the sauce before it topped off some fluffy couscous. The Hocus Pocus Syrah's smooth, silky flavors were a nice counterpoint to the cinnamon and cumin in the stew. It would be equally good with burgers, pizza, grilled meats, or other beef, chicken, or lamb stews that might be favorites in your house. I'm looking forward to watching to see what Black Sheep Finds comes up with next, and checking out their new releases. They will have a Cabernet Sauvignon coming out this spring, and after tasting this yummy Syrah, I'll be eagerly anticipating tasting it. 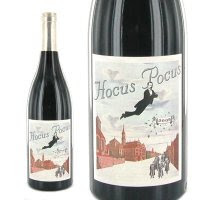 Meanwhile, you can get the 2005 Hocus Pocus Syrah from K&L Wines, the Woodland Hills Wine Company, and Wally's in LA. sounds like you, too, found a good one for WBW 30! I found a tasty for similar price from Langhorne Creek. 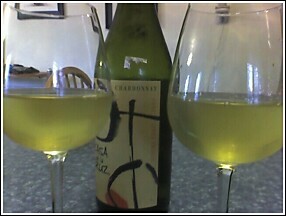 Hey Dr. Debs, did you pick this one up from Mission Wines? When I went there a few months ago and asked for a non-huge syrah under $20, they steered my toward this wine. It was a good buy, too - like you said, silky blackberries and blueberries. If I remember correctly, we had just finished a bottle of Domaine de l'Hortus Pic St. Loup Cuvee. The cool fruit of the Hocus Pocus was almost soothing after the Hortus, which tasted like the grapes were grown in a volcano made out of asphalt (I mean that in a good way - sorta). Hey, David and Seb. I haven't been reading the posts yet, David, but I'm eager to read yours since I'm kind of a syrah head these days. And Seb, yeah, I got it from Mission Wines just the other day when I realized I was out of New World Syrah :). I'm always so glad to hear that my palate is in sync with what others taste, so thanks especially for letting me know!